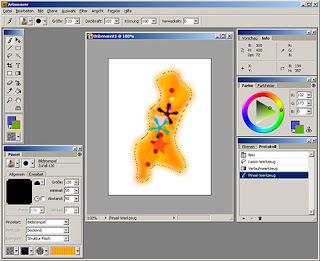 Artweaver is a Windows Freeware image editing program that can simulate natural brush tools. Artweaver offers you a clear program window, which can be used without training immediately. It looks very similar to Photoshop, unlike Gimp which has a weird look with too many individual windows. Anybody who is used to Photoshop's interface finds it diffcult to work on Gimp and prefer to work on Photoshop, even though Gimp is capable of minor to moderate photo editing and retouching of images. But with Artweaver you will find completely at ease. And it's only 8.4 MB!! No this isn't Photoshop. It's Artweaver!! *A wide variety of adjustment settings to customize the default brushes or to create new brushes. *Standard image editing tools like gradient, crop, fill and selection tools. *Support for the most common file formats like AWD (Artweaver), BMP, GIF, JPEG, PCX, TGA, TIFF, PNG, and PSD (no layer support). *Effect filters like sharpen, blur, emboss and mosaic. *Pen Tablet support for a realistic feeling. *History function to und/redo last editing steps. *Expandable by Plug-In modules (Artweaver Standard). *Support for many languages through language files. *Windows 2000, Windows XP or Windows Vista. *Pentium compatible processor, 600 MHz or greater (1000 MHz recommended). *128 MB RAM (256 MB recommended). *30 MB of available hard disk space. *800*600 pixels or greater monitor resolution (1024*768 pixels recommended). *15-bit color display (24-bit recommended). *A Pen Tablet is recommended.